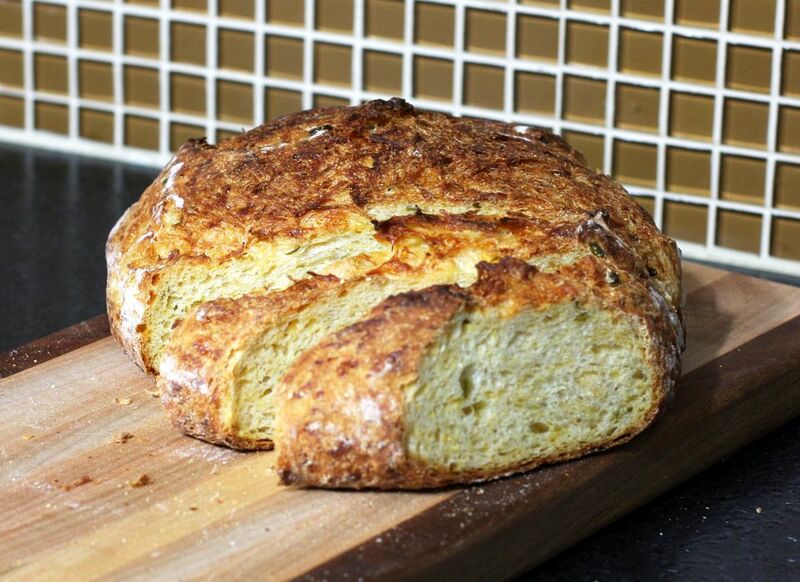 This jalapeno cheese yeast bread is amazing in both the flavor and the ease of preparation. Just mix the ingredients, let it rise for a few hours, then bake. No kneading and no fuss. All you need is a 4-quart or larger Dutch oven or covered casserole and about 3 1/2 hours of time to let the dough slowly rise. Combine all ingredients in a large mixing bowl or bowl of a stand mixer. Mix by hand or with the paddle attachment until all ingredients are well blended. The dough will still be quite soft and ragged looking. Cover the bowl with plastic wrap and place in a draft-free place to rise for 2 hours. Place a large sheet of parchment paper** on the counter and flour it generously. Scrape the dough out onto the parchment, trying not to deflate it too much. Coax it into a round loaf with wet or floured hands. Sprinkle with flour. Place it in a large bowl, parchment paper and all, to rise for another hour. Put the covered Dutch oven or casserole in the oven and heat to 450° F. Most lid knobs are safe to 450° F, but if not, the knob can be removed. Carefully remove the hot pot from the oven and place it on a wire rack. Drop the dough, parchment and all, into the hot pot. Put the cover back on the pot and return it to the oven. Bake the bread, covered, for 25 minutes. Remove the cover and bake for about 20 minutes longer, or until golden brown. * Try to weigh ingredients, but if that isn't possible, try to measure the flour and water as accurately as possible. The dough should be quite soft and moist and a little shaggy looking, unlike the typical smooth kneaded yeast dough. ** Parchment paper is excellent for all kinds of baking, but if you don't have it, you can still make this bread. Generously flour a plain cotton kitchen towel (not terrycloth, it will stick). Place the dough round on the towel seam-side down, flour the top, and cover with the ends of the same towel or cover with another towel. After the 2 hour rise, flip it over into the hot Dutch oven, seam side up.